More than 85% of millennials in US broadband houses subscribe to at least one over-the-top (OTT) video service from providers that include Netflix and Amazon, according to Parks Associates. The research firm said that more than 25% of millennials subscribe to three or more OTT services and more than 50% subscribe to at least two. 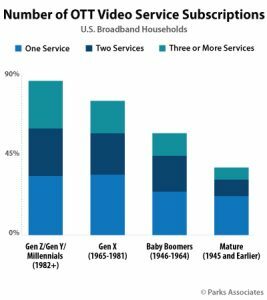 “Overall penetration of subscription OTT video services among millennials has topped out, suggesting that those households that want such a subscription already have one or more,” said Brett Sappington, senior director of research at Parks Associates. Millennials, a group categorised by Parks as being born in 1982 or later, were the largest consumers of over-the-top video, followed in succession by each older generation – ‘gen X’, ‘baby boomers’ and ‘mature’. While less pronounced, the trend towards internet video services was also noted among non-millennial viewers, with OTT service penetration among baby boomers (born 1946-1964) and mature viewers (born 1945 and earlier) up 10% overall between 2016 and 2017. “For consumers, self-aggregating content is simply part of the entertainment experience, particularly millennial households,” said Hunter Sappington, researcher, Parks Associates.